nspired by his own experience forgetting the correct notebook for an important meeting, Rocketbook co-founder Joe Lemay set out to find a modern solution for note taking in 2014. After testing out electronic pens and smart tablets, which were ultimately disappointing, Lemay teamed up with Jake Epstein to develop a new product, a reusable cloud-connected paper notebook called Rocketbook. Over the next year, Joe and Jake not only announced the world’s first microwavable reusable notebook, the Rocketbook Wave, at the 2015 Launch Festival, they also went on to raise $2 million in crowdfunding and graduated from the Techstars Boston start-up accelerator to make Rocketbook a reality. While continuing to perfect the Rocketbook app’s scanning abilities and adding digital connections with the likes of Google Docs, Dropbox, Evernote, and email, Joe and Jake also developed a wipe-to-erase version of Rocketbook called the Everlast. Today, the Wave and Everlast have combined to sell over 1 million units worldwide and inspired new Rocketbook colors, products, and form factors. They’ve also added even more app integrations with Slack, Box, and iCloud, as well as machine learning and Optical Character Recognition (OCR) abilities. 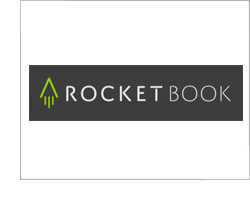 Rocketbook primarily sells its reusable digital notebooks on getRocketbook.com and Amazon, where it has earned the top spot for best-selling notebook, surpassing even traditional notebook brands. Rocketbook notebooks also appear in most of the big retailers you’ve heard of and even receive a healthy amount of bulk and branded orders from corporations like Nike, Pepsi, Accenture, and Genentech for special events and employee use. In addition to creating the best products that bridge the gap between traditional notes and the cloud-connected future, Rocketbook has also demonstrated a strong and ongoing commitment to supporting teachers and students. For every notebook sold on its website, Rocketbook donates $1 to DonorsChoose.org, an organization that connects public school teachers with funding for classroom materials. Rocketbook believes that writing by hand is more than tradition – it’s human. And with its products, you can stay organized in the digital age without giving up the scientifically proven best way to take notes.